A railroad spike from the Atlantic Coast Line Railroad (ACL). This railroad spike most likely came from the discontinued lines in the Orlando-Sanford area of Florida. These railways were in use from 1902 to 1967 when the Seaboard Coast Line Railroad (SCL) was formed and took control of the former ACL tracks. The railways were a main mode of transporting goods in Central Florida, until the roads were paved with the economic boom of the post-World War II era. These railroads helped the cattle, dairy, and citrus industry thrive in Central Florida and help create the economic boom in post-war years. Original railroad spike: Orlando Remembered Exhibit, Orlando City Hall, Orlando, Florida. 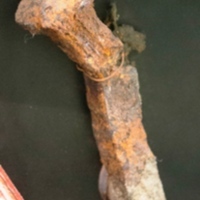 “Atlantic Coast Line Railroad Spike.” RICHES of Central Florida accessed April 18, 2019, https://richesmi.cah.ucf.edu/omeka/items/show/7878.